The corners of yellow card stock were cut with Fiskars’ Art Deco scissors. “Swirls & Dots Background” was stamped with a tinted embossing pad and the left of the card was embossed with rose glitter embossing powder, while the right side was embossed with a turquoise embossing powder. 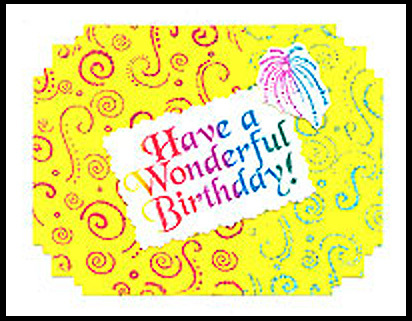 “Have a Wonderful Birthday!” and part of the “Fireworks” stamp were stamped with a Calypso Kaleidacolor stamp pad on white card stock and both were glued to the “Swirls & Dots Background.” Card by Davetta Alexander. Previous post: Happy Birthday Log Alphabet, Lg.